Master Lock ProSeries® Shrouded Padlocks are High-Security padlocks. The Solid Iron Shroud provides more security than a standard padlock. A standard padlock’s shackle is visible and vulnerable to bolt cutters, sawing, and filing. Shrouded padlocks are protected from these common ways to tamper with a padlock. The shroud, which is an added cover to protect the shackle, deters unauthorized entry. The Master Lock Company currently manufactures three Shrouded Padlocks: Master Lock Model No. 6321, Master Lock No. 6325, and Master Lock No. 6327. The Shrouded Padlocks are laminated steel padlocks encased in an exclusive cover. This cover is resistant to ice, water, and dirt. The main difference between these padlock models is their body widths. The 6321 is the leanest, at a 2-1/8in. body width. The 6325 is in the middle, with a body width of 2-3/8in. Lastly, the 6327 is the widest, with a 2-5/8in. padlock body. 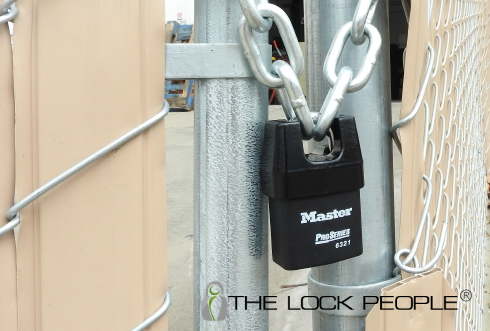 Master Lock® Shrouded Padlocks and Hidden Shackle Padlocks provide the greatest amount of physical security available. Both padlock styles obstruct unauthorized objects from getting to the shackle. A shrouded padlock features an extended body that adds an extra element of protection to the shackle. This added covering protects the shackle from bolt cutters and prying. These Shrouded Padlocks are part of Master Lock’s ProSeries®, a high security padlock line ideal for industrial and commercial use. ProSeries® padlocks feature hardened boron alloy shackles for superior cut resistance, dual ball bearing locking mechanism that resists pulling and prying, 5-pin & 6-pin cylinders, spool pins, and rekeyable cylinders. For multiple lock usage, ProSeries® Padlocks are easy to order Keyed Alike and Master Keyed with the correct key number. Master Lock created the ProSeries® to have standard components across the line including small format interchangeable core padlocks, making ProSeries® padlocks ideal for locksmiths to rekey.